Discussion in 'Weather' started by Ian D, Jul 3, 2013. Please add to this thread with examples of how to read more complicated maps and glossary of terms of jargon used. As a generalisation, if the blue line marked 5400 rises above the latitude of the Alpine region and there is precipitation following - shown as blue, green, yellow, etc - (i.e. behind or below the 5400 line) then that precipitation will most likely fall as snow. Otherwise precipitation will fall as rain. &quot;Thickness&quot; is simply a measure of the thickness of the air. A rough figure of merit is that 850hPa = 1600m, but note pressures do change with weather, so when we have a strong low, then that altitude will be less than 1600m. Similar to 850hPa, it shows the altitude where the temp is 0C. For obvious reasons. How much is going to fall. Dial in the dates you you're looking at there it is. The so called temprature of &quot;uppers&quot;. The colder it is in the upper atmosphere the better. Rat trap bindings likes this. I also look for something such as this. The dotted line following the front is an &quot;embedded trough&quot; or area of unstable air. Typically after a cold south west change the air will lose its moisture and therefore capability of producing snow. Ie it will dry out. Embedded troughs will increase the amount of moisture. When embedded in cold SW stream they are epic. Also re precipitation amounts that CC listed above. They shouldn't be treated as gospel in relation to the amount of snow that will fall. The the amount of snow that falls is also relative to temperature. Ie 10mm of precipitation forecast at -8 at 1700 will produce usually 2 to three times that amount. I use the freeze level charts vs the precip charts to determine snowfall. Its also prudent to take into account the duration a storm will be over the alps. A prolonged storm will always produce more snow than anticipated. Also in terms of precipitation, consider the effects of orographic lift. Models can be not that good at allowing for this, so you may well get more over the mountains than is shown on the model. You might need to explain the concept of orographic lift vs topography. Wiki can do it a lot better than I.
Orographic lift occurs when an air mass is forced from a low elevation to a higher elevation as it moves over rising terrain. As the air mass gains altitude it quickly cools down adiabatically, which can raise the relative humidity to 100% and create clouds and, under the right conditions, precipitation. I can decipher the info (or at least recognize what looks good and what doesn't) displayed on most of the charts you guys use and reference and I've managed to find some of them online for myself. My issue is understanding their progression and why you guys might or might not find the model charts to be somewhat fanciful. Accepting that certain models aren't all that reliable the further out they are, are there any indicators in particular that you guys look for to judge whether they're &quot;on crack&quot; as is sometimes suggested? Or is it just experience in watching the sort of weather we actually receive? That's probably something that can only be gained by experience I think. Essentially, based on past experience you can usually know what a weather system is going to do. If the model starts showing something unexpected, that's when you might consider you've got an outlier (perhaps due to a specific set of inputs the model has been provided). Its also personifying models Mick. They get traits...personalities. I know PG will disagree . Yet you spot trends and behavioral aspects. I mentally lay every model over each other, then expand them by each timestamp. Look at the progression and see if it looks logical. Using experience I guess of past outcomes. Its good to compare history. Yeah you have to consider also the rise in altitude offset by the distance the air travels . If the rise is gradual the lifting is slow and ineffective. The â€œSpaghettiâ€ model- its an ensemble model that graphs the height of the 500hpa (therefore the temp) using a &quot;spaghetti plot. In other words it creates a graphical &quot;mean&quot; or average of all the model runs. Its a trend model. rather than specific. 06Z GFS (00Z GFS) 00Z EC and the +84/96 etc that go along with it Thats just the time stamp of the model run on zulu time. LWT Long wave trough A measure of the polar vortex.. circles around the poles kinda like a cold lava lamp...spewing forth cold air towards lower latitudes. It has peaks and troughs...much like a swell on a ocean..the peaks are nodes. The best is a defined 5 node pattern. GFS = Global Forecast System - the US main model. Very long time lurker, new poster. This is a great resource thread for relative newbies like me. Much appreciated. Dont forget the weather links thread that shows all the links to models and other resources. So that helps with what those acronyms stand for. Of what use are the models from around the world for Australia's weather patterns? Which do the predictors (in their opinion) think most consistently predict the weather patterns? For my own interest, what's the significance of the Z on the time periods? This is all good stuff and will be great once we've got it all out and rolled up into a single page/post. So that helps with what those acronyms stand for. Of what use are the models from around the world for Australia's weather patterns? Which do the predictors (in their opinion) most consistently predict the weather patterns? IMO, the european model EC, is by far the most consistent medium range forecast model. GFS (US) is very good, but has idiosyncrasies. The classic &quot;all-in&quot; at 144 hours where the model predicts deluges before rapidly backing away &quot;downgrading&quot;. AXS-R tends to be very good within 3 days. It's also worth noting that models behave differently in Summer and Winter. Eg GFS tends to predict thunderstorm activity and precipitation from very well in summer. The Orographic lift effect is a little bit over simplified with respect to a prediction with respect to the main range. In a windy storm the snow is dumped then blown off the western side and the peaks (2200m) back to eastern side. Perisher, Thredbo, and Charlotte Pass. Often on these types of events the whole main range is stripped of any snow and the resorts are replenished each day with windblown snow. Thanks all this is excellent. Have been flicking around trying to put a lot of this together and a few times decided the good old BOM 4 day synoptic (Alan Wilke used to point at) is for me. But maybe there's now hope yet. Appreciated your time for this. Cheers. Yep these days this is the best chart and AXS R.
That's because the regional synoptic forecast model that BOM has developed is pretty good compared to say 5 years ago, its just a bit short sighted thats all. The GFS is the best to keep you thinking about the future ( two weeks) IMO. Well its just what happens based on observation of localized conditions. Try going up to the main range sometime after a windy blizzard. But the topography of the Main range is pretty flat and wider than high on the top. 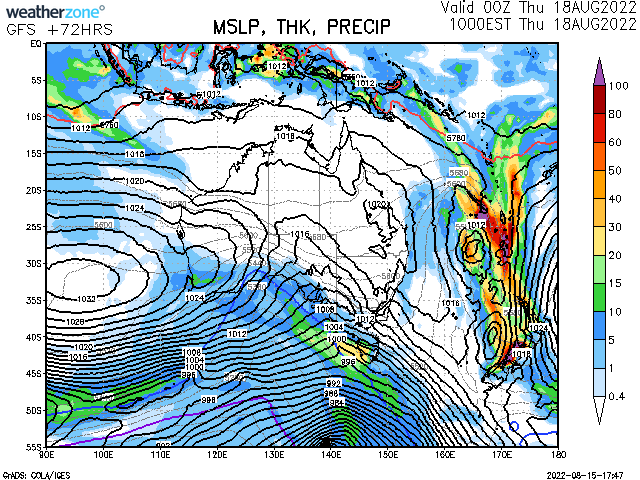 So you have to imagine that Orographic lift does not limit snow falls to Perisher or Thredbo too much. Rather it limits precipitation to the Monaro Plains and coast down here in Merimbula. That is the correct way to visualize the Orographic lift effect in the Snowy Mountains. Thats why we are fortunate here in OZ. Bom could and should update AXS R to include the topography better though. Very interested in properly reading this thread when I have some spare time. Actually what is most likely to happen in the future is that Access G will be further refined (down to 20 km or so) and Access R will be ditched all together. Instead you'll have high resolution models in in the majors urban areas (resolution of &lt; 10 km). No I don't. Each model will tend to have its own biases due to parameterisations that work better/worse under certain initial condition. The range of data assimilated will also affect forecast performance. The EC assimilate the most which is arguably the main reason why the are the best. This is different to what you said a few weeks ago, implying that models need time to 'bed in' during the early winter. This isn't true, the models have no automatic adaptive tuning or bias corrections over time. They aren't neural networks. Of course, the development team may identify biases in the model and alter various settings to give better forecasts but this happens manually, not automatically. mick chopps and cyclopath like this. Brilliant stuff, very informative and helpful! This certainly a very informative thread about what actually goes on in predicting the weather. Meteorologists have to look at so many different pieces of information and possible scenarios before they actually tell you whether or not it's going to rain or snow or whatever tomorrow. Fortunately for you guys down south the weather is fairly predictable with cold fronts coming through all the time. Northern Australia is pretty different though even in the wet season. The monsoon trough can be clearly drawn on the synoptic chart and not have drop of rain in it. A common weather forecast heard on local radio here over summer can read "mainly fine with the chance of an afternoon shower of thunderstorm". Wouldn't have a clue? You're dead right, called covering your arse. @Claude Cat I notice that you also run a thread for the cyclone season each year. Something useful to throw in there would be a video update done by a bunch of guys in Townsville called Oz Cyclone Chasers. I've been following their updates for the last 2 years and everything they've said that could possibly happen with a current cyclone event has been spot on using all the information mentioned above along with a couple of others like predicted humidity levels. Time to start a updated Weather Links Thread! Extreme long range (up to 2040 hours) CFS + JMA, GEM, GFS, EC. Here's a bunch of the relevant links I've bookmarked from these pages over the years. Of course you'll need to customise them to suit your specific purpose. This is Yr.No , a Norwegian forecast based on the ECMWF modelling . It is a simple go-to and pretty accurate if you're after a quick click. Here another easy read from BOM . AXS-R & AXS-G models . User friendly , just hit play and you get a fair idea of what is likely. @Claude Cat fave go to here. I has GFS , CMA , ECMWF, Gem and JMA so all the best of in one. (Pick and choose to compare). Similiar one from the UK. Stormcast is really handy as it has few other features , for you guessed it ...., which are easier to access than may be on the other models above. A great explantion from @Gerg of the Spag plot. This one is part of @Vermillion quiver he shared a while back , a good companion to Spag. Bit easier to read at times. Here's the latest good thing that @jeffx shared last week. A really great user friendly one stop shop for myself and I'm sure a few of us here. Plenty of bells and whistles when you spend some time to play. This another of mine fave quick go-to for , arguably , accurate live info from the hill. Add this and Thredbo together , divide by 2 and you'll be a bit closer onto it than the daily reports from the Resorts.IMO. I have a bunch of others that I look up at times to learn what is being talked about here. Bom Glossary is a starting point. If you really want to confuse your-self this will get you scratching your head but has a lot of actual / "live " - ish info. I've tried quote those that have shown me / us the links they have shared over the last 10 years or so. Many thanks to all who contribute here. Snowy Joey, DidSurfNowSki, Claude Cat and 1 other person like this. Couple more I look at every day , not just for snow but general weather watching. Based upon the UK Met Office Unified Model system. Has been pretty reliable this year Access-R , as it is only 3-days out. Look up wind , precip 850 , 500 levels in drop down box. Can also zoom in on State view. Snowy Joey, nfip and POW_hungry like this. Thanks go to @Wheres Walle I believe for this one! Have a play, the BC folk are impressed. Snowy Joey, nfip, Jellybeans1000 and 1 other person like this. Snowy Joey, Jellybeans1000, Claude Cat and 1 other person like this. Guide to Aerological Diagrams. This is my number two observation resource, after actual snow reports. It really is worth taking the time to understand these charts that have heaps of data for you to use. Rat trap bindings, nfip and Claude Cat like this. Thanks guys for this resource. Please keep adding more! Meteostar GFS charts, some charts not on Tropical Tidbits. These are for North America, but they are Weather Links! I guess most people know and often use the big global models GFS, EC, GEM, UKMO, etc for predicting snow for North America. But lots of people don't use mesoscale models. IMHO within a 5 day range, these are the charts to check. Mesoscale charts are charts that use a higher resolution than the big global models. This allows a chance to see more localised falls and smaller systems, where global models are good at looking at the bigger picture. Here's my guide to make sure you don't use the wrong one. This is the standard mesoscale chart used by many news weather meterologists and parts of the General public. It is good within 3 days, terrible beyond that. Some meterologists say this chart has poor accuracy, despite its higher resolution. Use caution with this one! This has got heaps of graphical forecasts and is used for NWS forecasts. The benefit of this is it uses internal NOAA data and data from the big global models. So this is the model using the data from all the other models. This model uses NOAA data to predict severe weather. Good if you want to know when a blizzard is due. This is another general mesoscale model using a variety of NOAA data. This is often considered to be better than NAM and is my personal choice for forecasting snow. This is a very short scale model, only going back 6 hours. It predicts the rain radar and is good for knowing when it is going to snow during that day. Says it in the name, it's an ensemble of forecasts similar to both SPC and NAM forecasts. This is the mesoscale model from the NCEP using NOAA data and the WRF Model. This is the main mesoscale model from the CMC. This is a higher resolution version of the RDPS. All these have maximum ranges of 6 hours to 7 days. They are best considered within 5 days of the event, and are most accurate within 3 days of the event. These are great tools if used with global models. As I said at the start, things like the polar vortex, massive cold fronts, arctic nodes, etc should be observed from a global model, but mesoscale models are great for looking at smaller sections of land, smaller storms, localised falls of snow, etc. Some of you might use these tools, but this is just a handy list of most of the NA mesoscale models. This site contains many good quality GFS and NAM maps. These also contain good quality meteograms too. Enjoy. Jeffx mentioned the Hadley Cell relating to the current hot spell. Here's a link I found really helpfull on the Atmospheric Circulation topic. Sydney Hobart is on the menu. Part of the two course meal known as Boxing Day ! Link here for Marine Services , a good resource and critically relevant for the mighty race. CDAS is essentially a model from the US that uses tech and knowledge from pre1996, often called Legacy GFS. Add in this for 31 day verifications. EC always is the best @500mb verification, is all that plot shows.